Ruth Ann Lee recently left the MacKenzie Center staff to accept a position with the Wisconsin Wildlife Federation. During her 10+ years at MacKenzie, Ruth Ann has worked closely with the Friends of MacKenzie as an educator and (for part of her tenure) as the center’s director. We will miss her great organizational skills, educational leadership, and enthusiastic attitude, but wish her much success in this new chapter of her career. Bill Quackenbush, Tribal Historic Preservation Officer, and two other representatives of the Ho-Chunk Nation guided DNR MacKenzie Center staff and Friends of MacKenzie volunteers through the construction of a new Ciporoke in January. 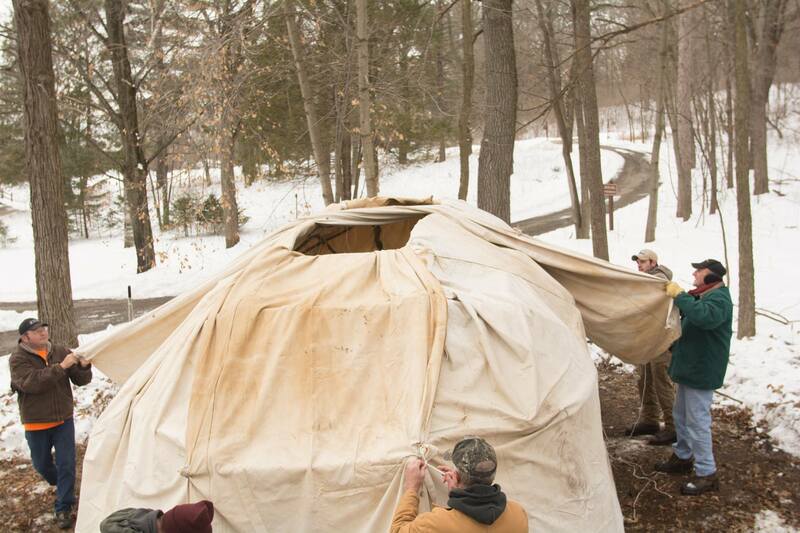 Ciporoke (pronounced Chee-po-tah-kay) means “round-dwelling” in the Ho-Chunk language and is the type of home a Ho-Chunk family would have lived in during maple sugaring season in the 1300s. Ciporokes are still used today, and this Ciporoke will be an important part of the MacKenzie Center’s Maple Education Program, where students learn historic and modern processes of making maple syrup. The Natural Resources Foundation of Wisconsin recently announced the creation of the LaBarbera-Vaughn Outdoor Heritage Fund. This fund has been set up to support outdoor sporting education. One of the endowment’s goals is to help the MacKenzie Center with outdoor education and skills training or interpretive signage. How fortunate we are to be beneficiaries of this new fund! Learn more at the wisconservation.org website. MacKenzie Center’s annual education program begins in March and your help is needed in many areas. Volunteers will be trained to conduct student tours, boil the sap, process the maple syrup, and assist with other “sugarbush” duties. No previous experience is necessary, but we do caution you that this experience is addicting! Training sessions are scheduled for February 23rd and 25th from 9 am until noon. Volunteers will be needed during the month of March and for the Friends of MacKenzie’s Maple Festival on April 4th. Please let us know if you are interested in volunteering by emailing us at DNRMacKenzieCenter@wisconsin.gov or call (608) 635-8112 prior to February 16th. The MacKenzie Center is located two miles east of Poynette on County Road CS. For more information on the MacKenzie Center please visit us on the web at http://dnr.wi.gov, and search MacKenzie.